Health authorities in Jeddah have shut down an "illegal" women's fitness centre attached to a hospital, closing one of the few venues where Saudi women are able to exercise, local media said on Wednesday. Although health officials have repeatedly blamed the high rates of heart disease and diabetes in the kingdom on poor diets and lack of exercise, health authorities said women's fitness centres were not allowed. "Anyone who violates regulations governing the running of health facilities would be punished severely because this involves people's health," Jeddah health official Muhammed Abdul Jawad told the English-language Arab News. The reports did not identify the Jeddah hospital affected, but a photograph in the Saudi Gazette showed an official sealing the club door with an announcement reading "Closed on the order of Jeddah Health Affairs." 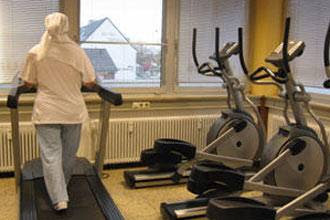 While gyms for men in the gender-segregated conservative Islamic society are permitted, women's health clubs are forbidden, despite a clear demand shown by a surge in underground facilities in the past two years. But last year a number of stand-alone women's gyms were shut, though some attached to or inside hospital premises continued to function. The reports said the country's municipal and rural affairs ministry had recently closed two other gyms in the Red City of Jeddah and one in Dammam, eastern Saudi Arabia. I hate hearing stories like this. It makes us Muslims look so backwards and foolish. Was there any reason given for the shutdown besides "it's against the law"?